After trees are felled, the parts that remain in that particular spot are called tree stumps. If you are planning on using that part of the property, you will have to remove the stumps. 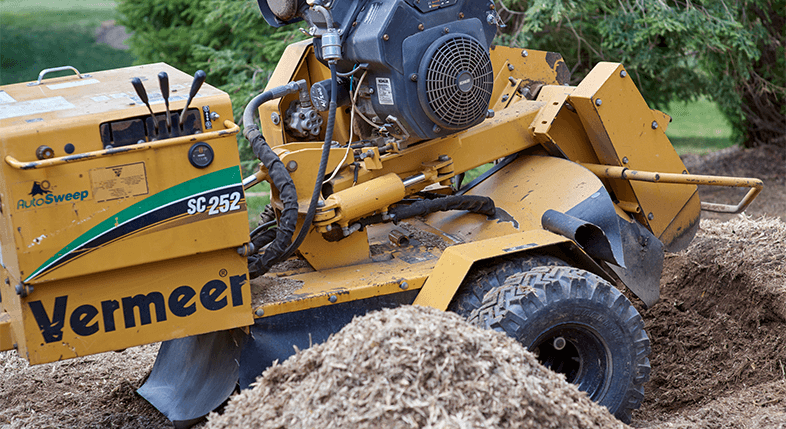 Tree stump removal is not an easy task and if it is not carried out in a professional manner, it could lead to extensive damage of the property. If you are looking to get rid of the tree stumps then you should give us a call. This process requires a tree stump grinder. There are many types of tree stump grinders in the market from the self-propelled to the push along. This type of equipment requires only the best technicians to use it. At Valiant Arborist, we have a team of tree stump removal experts who have years of expertise so you can rest assured this will be done efficiently. The size of the tree stump. The species of the tree. Whether the tree is an oak, a willow, a conifer or any other species. Our equipment is insured so we will not charge you any extra costs that may put a huge dent on your budget. Our experts will carry out a thorough inspection of the tree stump to determine its depth and whether there is any debris which may damage the tree stump grinder. We will also take account of the number of stumps which are required to be removed and the extent of damage that may have been caused. So if you are looking for tree stump removal in Essex or stump grinding you know who to call.